Prince Charles and Ray Helm discussed the work of Samaritan’s Purse on Barbuda. This past weekend, Prince Charles visited Caribbean islands that were devastated by hurricanes Irma and Maria, including Antigua and Barbuda. During his time on the ground, the prince saw firsthand both the damage that the powerful storms left behind and the work that Samaritan’s Purse is doing to help thousands of families in need. Blue tarp from Samaritan’s Purse now covers many of the homes on Barbuda. As Prince Charles flew from Antigua to Barbuda, he noticed the blue Samaritan’s Purse tarps that cover the town. With more than 1,200 tarps distributed across the island, Prince Charles thanked Samaritan’s Purse for generously helping families in need. Charles and Netta Williams, a Barbudan family that the prince visited, said that Samaritan’s Purse was key in helping them come home—providing a tarp, generator, and access to clean water. The Williamses took shelter in their living room as Hurricane Irma barreled towards their small island. Soon, water started coming in and the walls began to shake like it was an earthquake. Their family of eight, including two infants, relocated to what they hoped would be a safer room. As soon as they did, large concrete rafters crashed through the ceiling and crushed everything inside of their living room. As soon she completed the first verse, the hurricane calmed. Thanking God for hearing their prayers, they ran across the street to a neighbour’s house to weather the second half of the hurricane. They said without God’s protection they would have been killed. “God’s been good to us. God bless Samaritan’s Purse because without them it would be so hard—we don’t even know how hard—but because of Samaritan’s Purse a lot of us can come home,” Netta said. Charles and Netta regularly fill their jerry cans with clean water at the Samaritan’s Purse water treatment unit. This reverse osmosis system transforms ocean water into fresh water, providing the only sustainable source of drinking water on the island. Already, this unit has produced more than 126,000 litres of clean water. 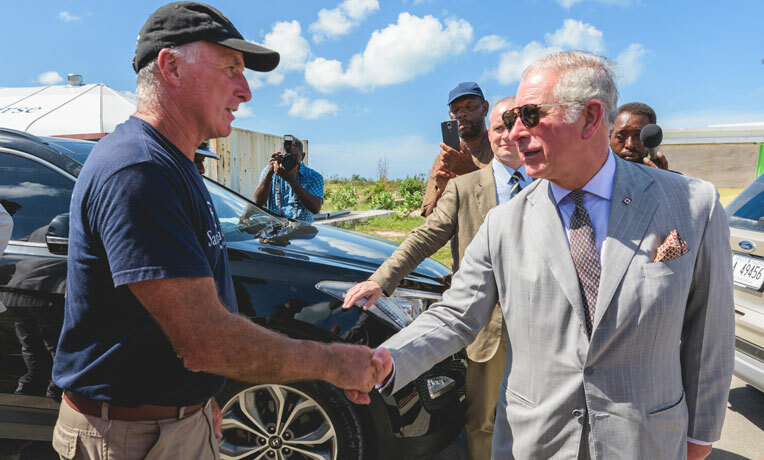 Prince Charles thanked Samaritan’s Purse team members for their generosity and hard work in the Caribbean and encouraged them to continue forward in helping families recover. When Prince Charles met Cannye Nedd, a Barbudan homeowner, he asked if Samaritan’s Purse had provided any assistance to her family.  Cannye immediately began thanking our team for helping her family pick up the pieces. Cannye was especially grateful for the tarp and generator that she received. The tarp—replacing her roof that was blown off by the hurricane—is protecting the small number of books that she was able to salvage from her school supply business, which she hopes to reopen soon. 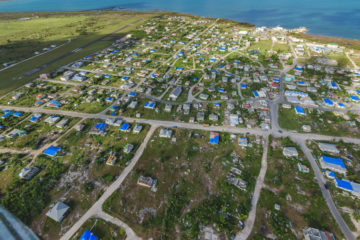 Samaritan’s Purse is establishing a country office in Antigua and Barbuda to provide long-term assistance to families who lost everything in the storm. We are committed to building a transitional shelter for every family that needs it as they begin the process of rebuilding their homes. This office will also oversee our recovery efforts on the island of Dominica.